Sunday we were up early to load the van/family up to head North of Topeka for a family barbecue. Before we left I decided to change the garage door code as well as set up the button in the Minivan. Once I had all that done we were ready to roll. Our plan was to spend Sunday evening there as well as Monday. We got to the family get together and there was a mass of food getting ready for consumption. We all shared a great meal and filled each other in on life over the last year or so. After the meal is when things got interesting. Many folks went for a walk down to the creek while others stayed close and fiddle farted around. I was in the second group and I just happened to have a metal detector with me. The farmstead was built by Queen Ukena’s great grandparents in the 1890’s and I love detecting around there. I dug a few wholes and the last signal I dug was a silver ring with a ruby like stone in it. I didn’t get a picture of it because as soon as I got done filling in that hole it started raining. I only got to retrieve 5 targets but considering one of them was a ring I was satisfied. It continued to pour for at least a half hour. The people that had gone on the walk made it back to the house just in time to not get soaked! We all huddled up in the metal garage and tried to have conversation of the sound of the rain on the steel roof. It was relaxing and mesmerizing. After the rain ended all the kids went out playing in the puddles and getting dirty. There was also a non operating hay bale stacker that the kids were pretending to drive and work on. It was nice to see all the kids playing together. Shortly before dinner we all decided to call it a day and we headed over to the home of the Queens cousin. We were planning on staying the night there and unloaded our overnight bags and got settled in. The home we were at was yet another old farmstead that had a huge clothesline. I had to detect it. I grabbed my trusty Ace out of the van and got to work. I found a zincoln, clad quarter, piece of dog collar, and then I heard the sweetest tone of the day. 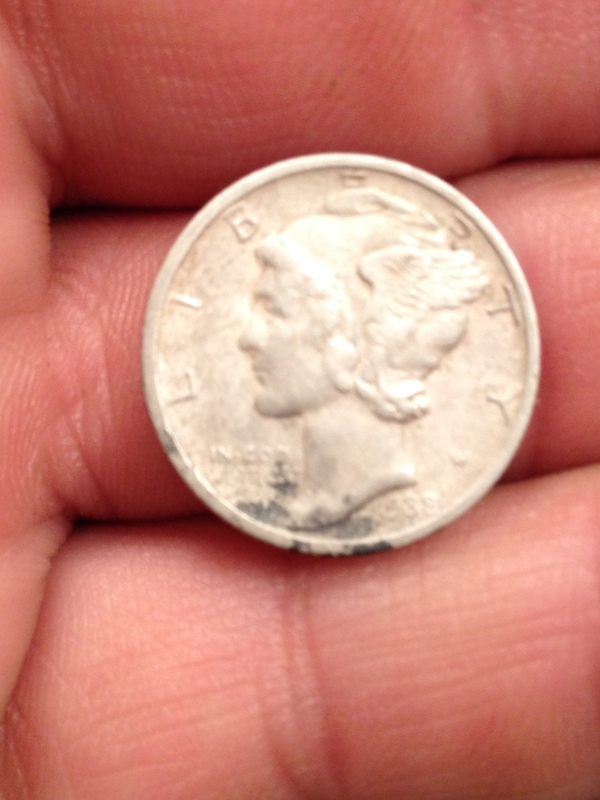 I found myself looking at a silver dime in my 4th or 5th hole. I quickly found the pump and rinsed it off to see my favorite coin. 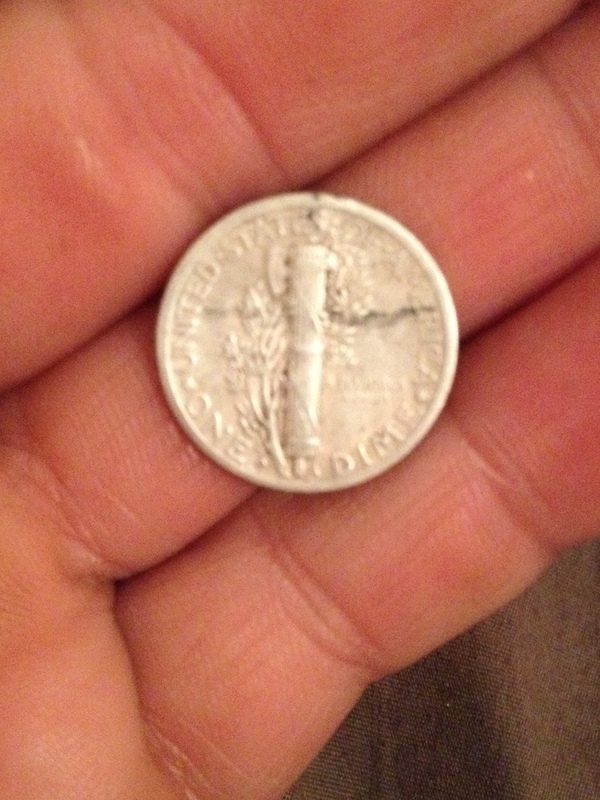 It was a 1938D Liberty Head dime. 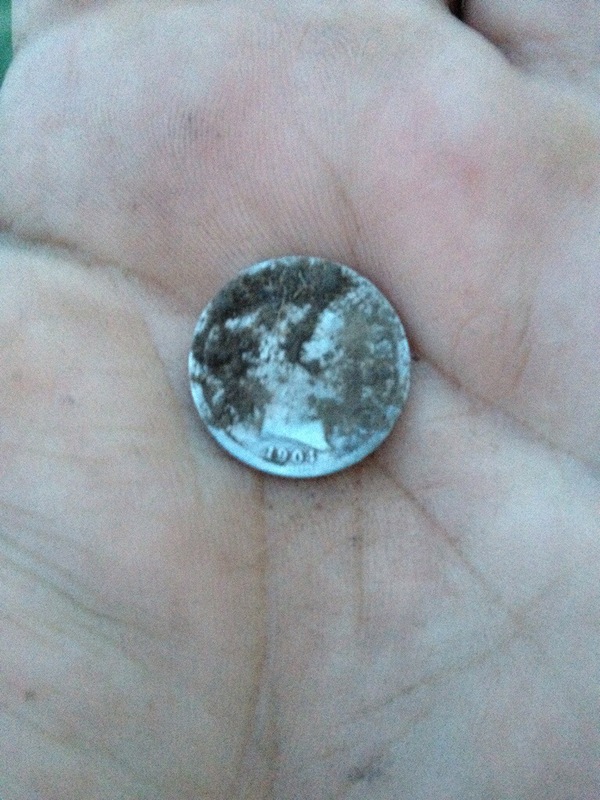 Once I got the dime cleaned up we all decided to go ride some 4wheelers and we were enjoying tooling along in the country. Then we learned that the Queens Mom was at our home 3 hours away without a way to get in the house and let the dogs out of their kennels. I guess that when I programmed the vans garage door opener I undid the keypad code which kept her from getting in. We tried to think through a solution and came to the fact that we had to make the 3 hour trek and not spend the night. This saddened several and guess who had screwed it all up. That’s right this guy! Anyways we got back home at 10:30 and we had a peaceful drive home because the kids were fast asleep and they were wore out from the day. All total I drove for 6 hours, detected for about 45 minutes, and had a great time with family. Now that we are back home I have plenty of things to do. Well we are slowly getting settled into the new home. The other night we were headed to a baseball game. In route I saw a sign that caught my attention in rural Butler County. It said ????????? Church established 1900. I had to know more! A quick Google search led me to a page about the history of the church. I wanted to detect it and I found a contact to email. I quickly sent him an email asking permission to detect and was granted it. Wednesday evening another MDer and I headed out. 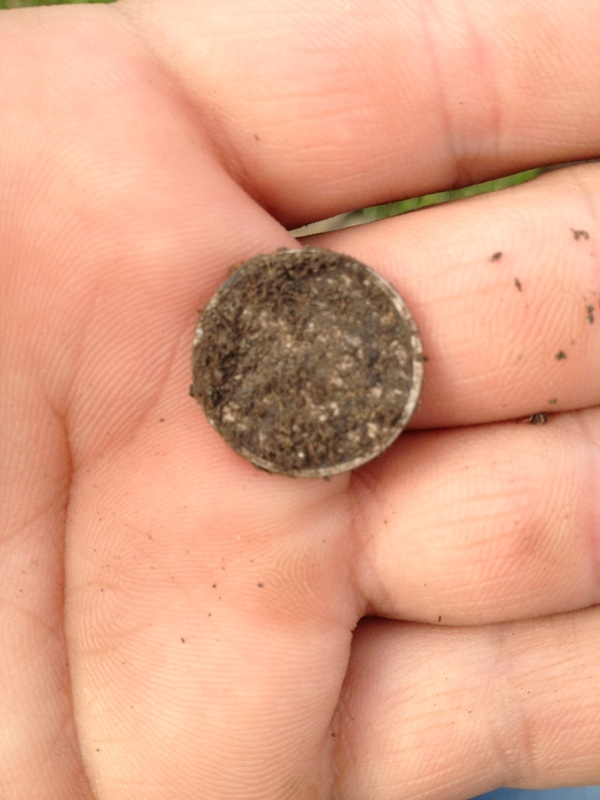 Things started a little slow with us finding a couple of zincolns and clad coins. 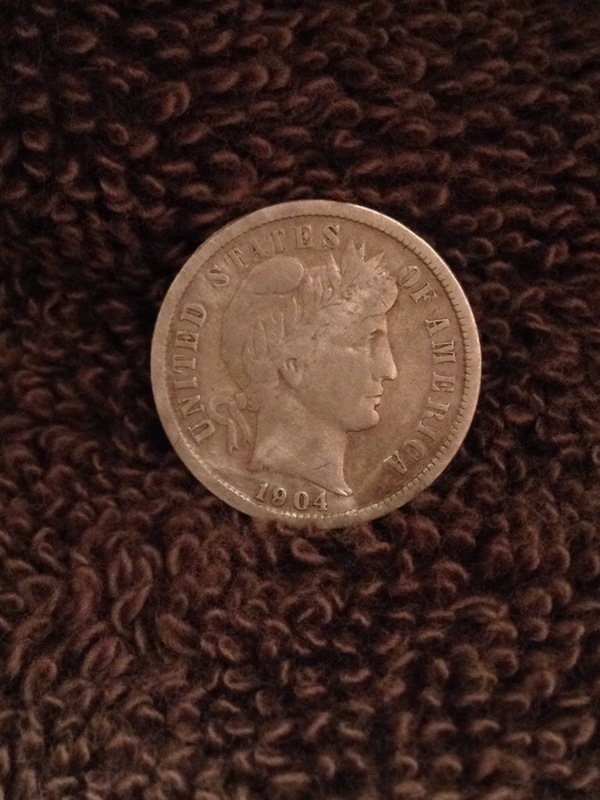 Just before dark I gut a pretty sweet signal on the Ace250 and was blessed with silver in the form of a 1904 Barber dime! 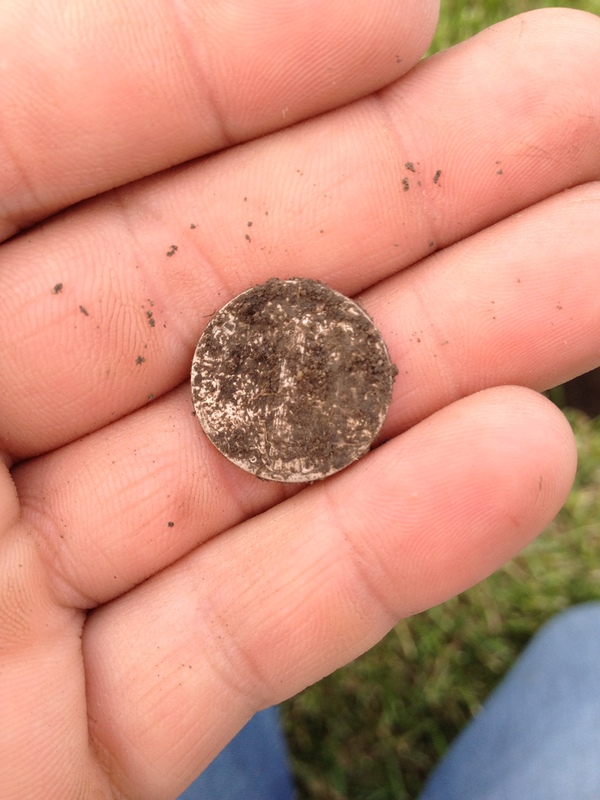 I was hoping for a seated coin but I won’t be picky. As we were finishing up our permission granter told us where the church has always had picnics. We will save that for round 2 but I am hopeful there are more coins that will reveal themselves! We have been moving for two solid days. 1 more trip to clean stuff up and we will be done! Well except for unpacking and getting the basement finished, and getting organized!